President Franklin Delano Roosevelt pulled off two major miracles – leading Americans out of the Great Depression and inspiring them to victory in World War II. He was a highly influential force in American politics and has even been ranked alongside Lincoln and Washington as one of the greatest American presidents. Test your knowledge of F.D.R. 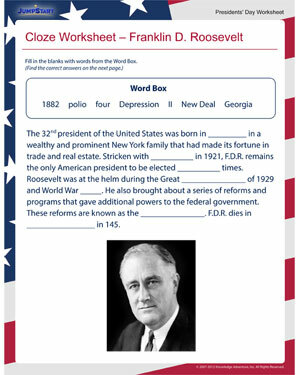 with this cool Presidents’ Day worksheet for elementary. And when you’re done, don’t forget to check out these Presidents’ Day resources for multiple grades.